Skopelos restaurants have a great history in baking exciting pastry choices. Mille feuille is one of them! This gourmet dessert is popular because it is light, sweet and when made with fruit, is healthy too. All great chefs know that although seems easy, to make magnificent mille-feuille, worth tasting again and again, you need to select the finest ingredients and pay extra attention during baking time. But above all, the secret lies in its presentation. Because a great mille-feuille differs from a simply good one, when you cannot wait to taste it just by looking at it! Take a look at our Lemon mille-feuille and taste a similar version at Skopelos restaurants. We roll the pastry and cut out about 16 rectangles. We place them in a baking tray, icing it with sugar and then put it in the fridge for half an hour. After 30 minutes, we place the baking tray with the pastry in the oven and bake it for 10 minutes. While the pastry is getting baked we make our sweet cream adding in a bowl sugar, vanilla and lemon juice. 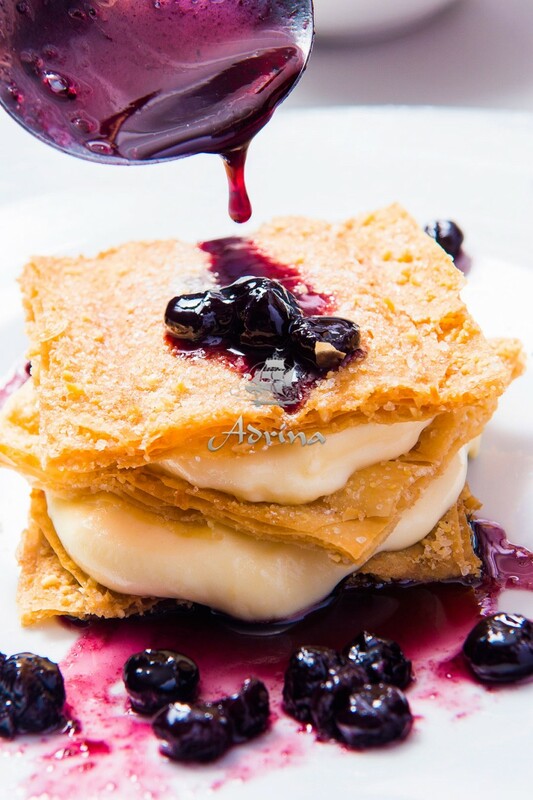 When baking is done we place a rectangle pastry piece on a plate and sour it with the cream, adding a few blueberries in the process. Then we add another pastry thin on top and repeat with a final layer. On top we sprinkle with icing sugar. Do not miss out on this delicious experience! Ask for this exquisite dessert in all great Skopelos restaurants and enjoy an experience only a mille-feuille can offer you!